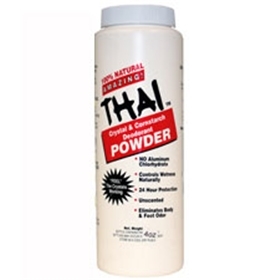 Thai Deodorant Stone Thai Crystal and Cornstarch Deodorant Body Powder - 3 oz. Thai Deodorant Stone Thai Crystal and Cornstarch Deodorant Body Powder not only stops body odor, but also eliminates wetness. It combines cornstarch with the deodorant stone crystals. Crystal And Cornstarch Deodorant Powder is made without fragrances or preservatives, keeping your feet dry and fresh all day long! This amazing 100% natural product combines crystals and corn starch to keep your feet smelling and feeling great! Enjoy the safe but gentle maximum protection from embarrassing odors, without exposing yourself to harmful chemicals. Deodorant Stones has formulated Thai Crystal And Cornstarch Deodorant Powder, a 100% effective, natural deodorant powder made from pure crystal and cornstarch. These finely ground crystals kill odor causing bacteria, while offering 24 hour protection and controlling wetness. Try Thai Crystal And Cornstarch Deodorant Powder, a natural product for people who care about their bodies and the environment. No added scent- contains crystallized mineral salt and corn starch. Contains no aluminum chlorhydrate or talc. What is Alum? Is it the same as Aluminum? Alum is a salt, aluminum is a mineral. Alum is taken from Bauxite ore, and is in no way harmful to your body. Aluminum has been suspected, although not proven, to be harmful. There is absolutely no Aluminum Chlorohydrate in our deodorants. In fact our products are so safe they are used in the purification of water in some countries. Sprinkle the powder on the dry areas of the body, or use a powder puff to apply where needed. Is it okay to work on other parts of the body? Sure, works great on feet and any parts of the body where odor might be a problem.